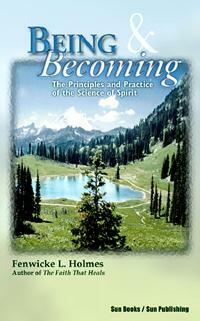 Being and Becoming-The Principles and Practices of the Science of the Spirit by Fenwicke L. Holmes. Part 1: The Impersonal Mind, Becoming, Allowing Mind to Act, Unconscious Activity, The Great Law of Mind, The Law of Correspondence. Part 2: The Personal Spirit, The Purpose of Spirit, The Motive - Love, Making Our Unity, Love - The Healing Power, etc. 50 pgs. 5x8. Paperback. ISBN: 0-89540-263-7. $5.00.